UPPERS: Split leather and microfiber. Mesh on both sides for increased breathability. 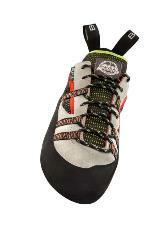 Full length lacing system to the toes and lateral fastening straps for a highly personalized fit. Padded CHS heel and HFS for extra comfort. CHARACTERISTICS: The highest comfort level, thanks to its last, the padding in heel and upper, and thecomplete 3D mesh lining. 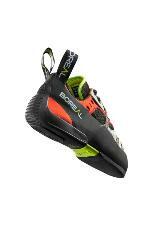 For long climbing sessions. Fit inyour street shoe size to wear all day or in smaller sizes for increased precision. The Joker Plus Lace features a new super-comfortable semi-asymmetric last with slimmer fitting heel and low tension rand. An upper of high quality split leather and synthetic microfibre is combined with a PU Air Net lining for exceptional comfort and a fresh new look. A full length lacing system ensures a precise and highly adaptable fit. Our Heel Fit System ankle padding is updated for 2017, providing luxurious feel with reduced bulk. A newly developed outsole now includes a specially shaped heel cavity, allowing the shock absorbing EVA of our Cushioned Heel System to work more effectively without impeding fit. A new stiffer midsole helps provide support while edging, and the sticky and durable Zenith Quattro rubber provides the ideal blend of durability and friction. If you like longer routes in the mountains, full days at the crag and extended training sessions, Joker Plus Lace is the ideal choice. Put them on, keep them on.